One of the first things the hotel receptionist said to us as we arrived was “Welcome home!” and, to be honest, it felt a little bit like that as I had worked here (and lived in this hotel!) for 5 months in 2010. The island (and hotel!) hadn’t changed much and was still just about as idyllic as it gets: sunshine, beaches, nature…gaah. Before flying out, I’d been in touch with the local marathon committee to see if anyone would like to run with me. 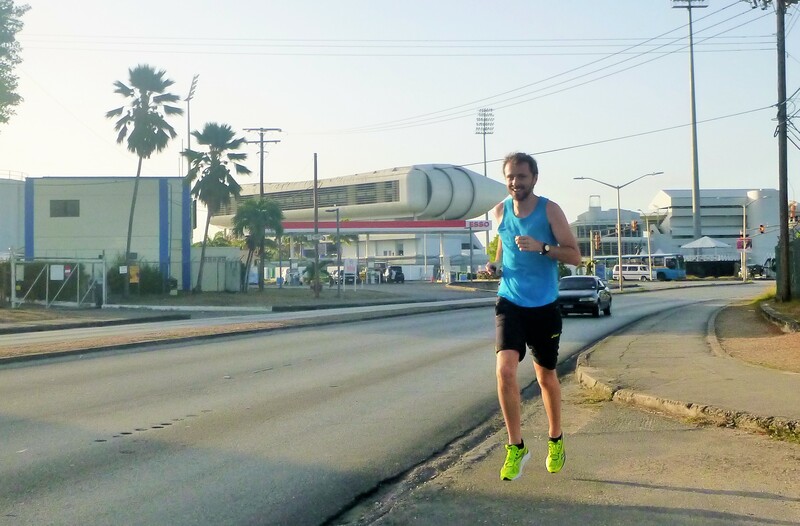 They helpfully put me in touch with a running group but their session involved a 5am start from the other side of the island and, without a car, it was impossible to get there. With that in mind, a few days later and now with a car, I decided to run the half marathon course with a plan to stop half way unless I felt in super form (which I didn’t). The alarm destroyed our nice night’s sleep at 5.30am and it’s probably fair to say that the holiday was feeling less and less like one to Pippa at that point. Anyway, with a pretty pissed off smile on her face, we headed down to the bandstand in Carlisle Bay, which is where the official half marathon normally kicks off from. This was where I ran past my first (and last) runner of the day, who seemed to be finishing his race at 6am. A very sweaty hour later, I had worked out that there was a very good reason why the other running group met up at 5am! 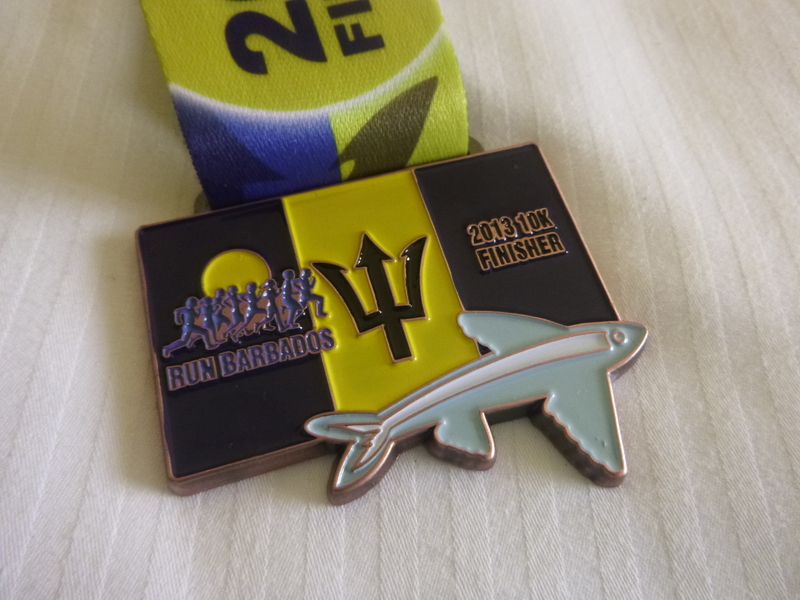 The official course takes you past a few “pay entry fee then free drinks all night” bars which I was obviously totally unacquainted with from my previous time here, ahem, before heading into Bridgetown, the capital, and into the ferry port. 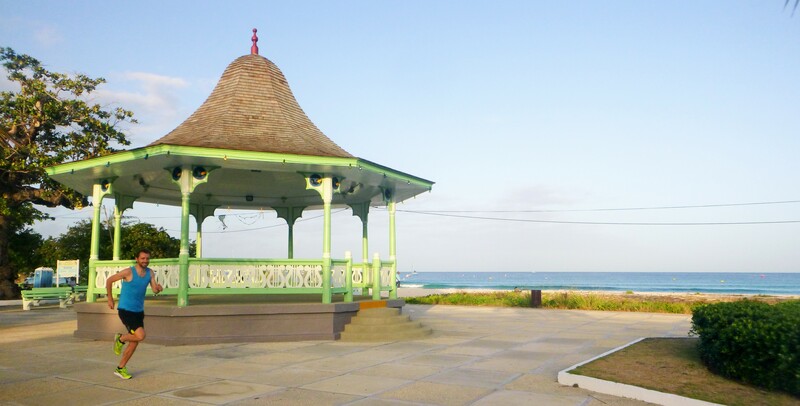 Bridgetown is small but has its nice areas, in particular around the Independence arch. On the way, I went past the Kensington Cricket Oval (which copies the London Oval) a dozen and a half petrol stations and Chefettes, the local fast food chain. Barbados is one of the few countries without McDonald’s. Randomly, I’ve already been to 7 other countries without any. Also on the list are Somalia, Afghanistan, Yemen or North Korea. Wonder what their marathons are like. Mmm. If you get lost…follow the signs! As the hills kicked in after a few kilometres, the sun crept up over the island and the run became stickier, slower and sweatier pretty damn quickly. Thankfully, only a few kilometres later, the clouds turned up – a blessing!, just as I was approaching the posh, then quite posh then mega posh side of the island. There, the Chefettes became Louis Vitton outlets while petrol stations became golf courses. The roads are not particularly pedestrian-friendly so I had to keep hopping from one side to another but, unlike in Mumbai or Kuala Lumpur, I never really felt in danger. You also can’t get lost, just follow the bus signs (‘To City’ or ‘Out of City’ until you’ve looped the whole island)! 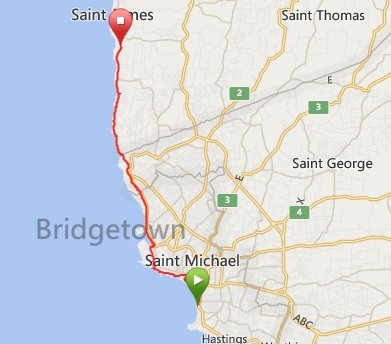 I must have slightly misjudged the mileage as I went past 10km – my planned stopping point, and there was still a way to go. On the plus side, I was now running along a white sandy beach with a turquoise ocean and palm trees. It could have been worse. 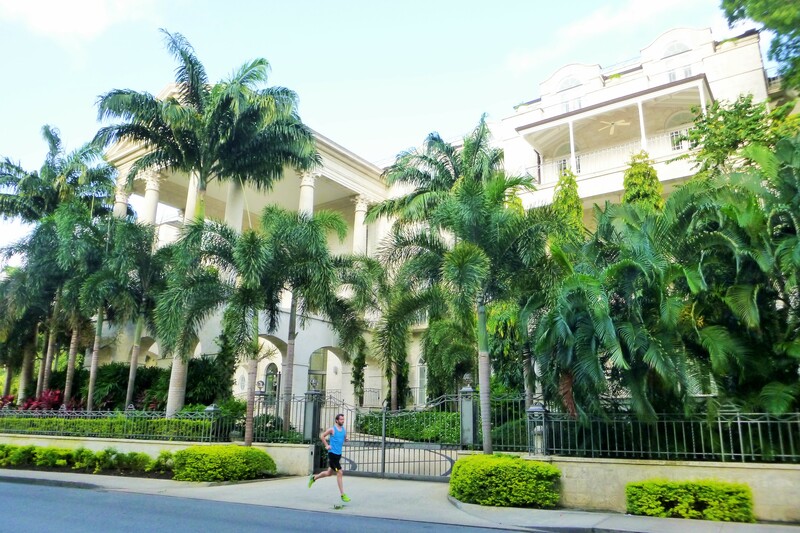 Finally, we got to One Sandy Lane (Roman Abramovich’s house/palace/compound/castle) and I only had one small climb left to get to the Sandy Lane golf course, an uber-exclusive (~£1,000/night!) hotel, where I finished and we had a nosy around. Our tiny Chevy Spark looked a tiddly bit conspicuous in their BMWs and Maseratis-laden carpark but, despite falling foul of their ‘please bugger off’ “non-resident policy” (sigh! ), we had a good twenty minutes wandering about before leaving. 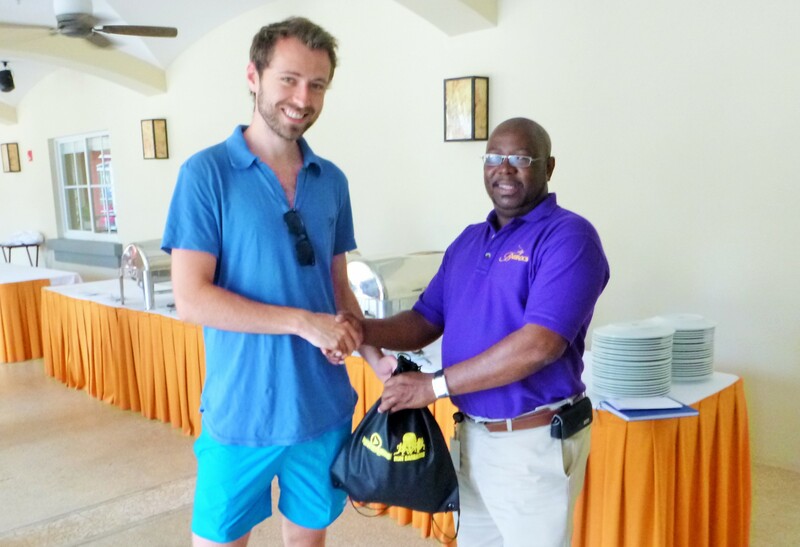 A few days later, I met up with Winston Carter, from the marathon committee, who had very kindly offered to give me a left over medal from last year’s event as a souvenir. I got a little more than expected! 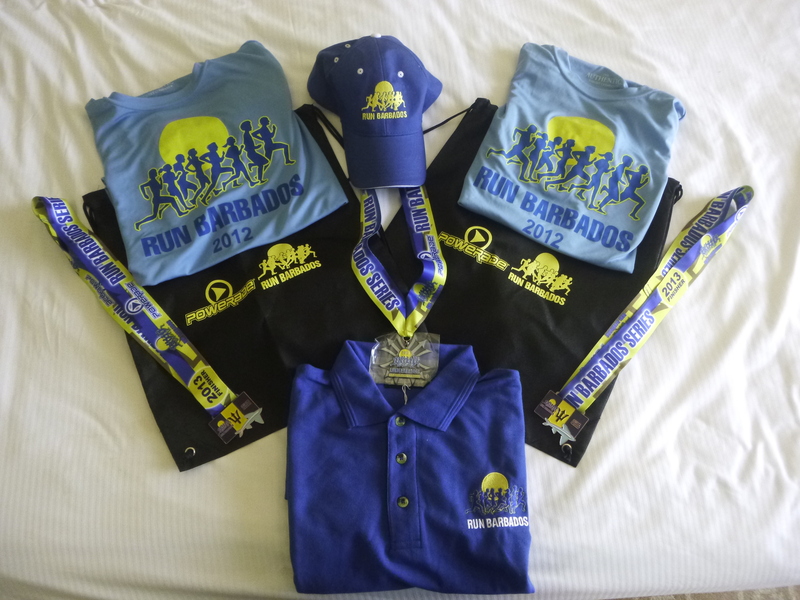 Two running tshirts, a poloshirt, a cap, a goodie bag and … three medals: one for the 5km, one for the 10km race and one for the half marathon! I “claimed” the 10km one and made Pippa do a 5km run around the Garrison the next day so she got her medal too! 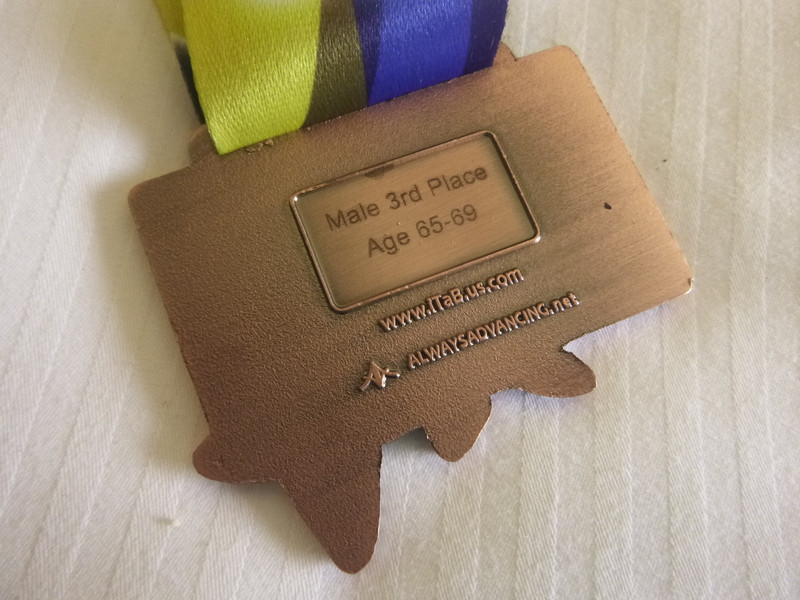 Amusingly, my medal was meant to be for the third best male aged 65-69, who I suspect could still probably outrun me! Anyway, I’ll take it! All in all, a nice, sticky, sweaty, sunny and tropical 12km run! 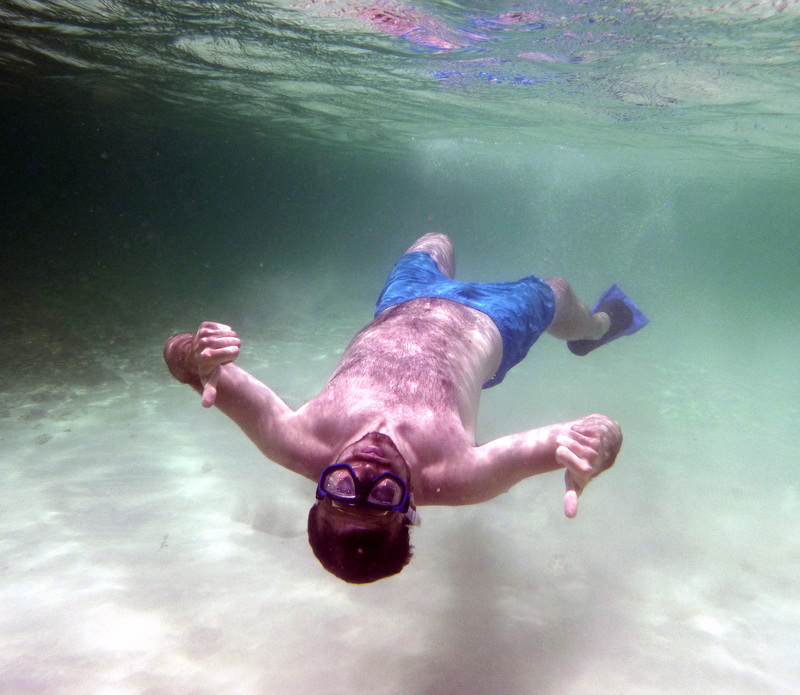 And, as a aside, a video of some fun we had in Carlisle Bay! It gives me hope however to see that it is doable! You’re a crazy dude, how are you funding this? To add to your bucket list, I’d recommend the Bogotá half-marathon.. But I’m biased because I’m from there! ha, thanks! Most of the funding is through air miles or cheap European flights! And saving money through not spending money on frivolous stuff (unless it’s running-related, I have far too many shoes!). I will keep Bogota in mind – good luck for your travels!